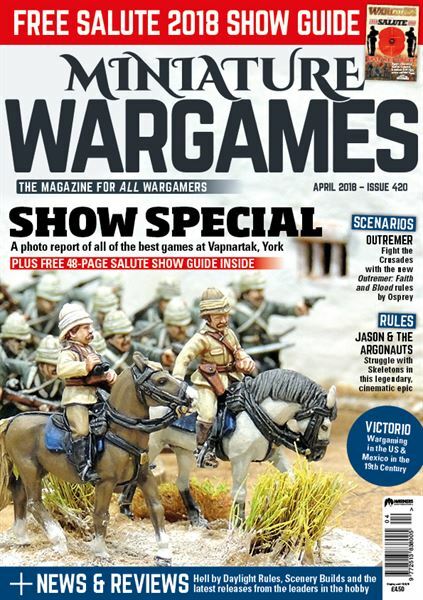 What’s in effective range in (mostly) historical wargaming with reports on Warlord, Rubicon and much more. All hail the late King of Ruritainia! Mr Kinch takes an ill advised trip in the midst of a civil war. Part three of a set of rules for 20th Century Skirmish: Air support and hand-to-hand combat! Pyrenees: July 1813 - another wargames poser by Jon Sutherland. Fight the Crusades with the new Outremer: Faith and Blood rules by Osprey plus a unique scenario by the author. The usual sensor sweep of the latest news in F&SF gaming with releases from North Star; Ground Zero Games; CP Models; Atlantis Miniatures and Brigade. Rules and suggestions for playing this cinematic legend on a truly epic scale: 1/6th. Part two of the guide to Wargaming in the US and Northern Mexico in the late 19th Century. What’s top and and what to let drop with reviews of 13 of the latest book releases. Dusty but flexible roads that stay where you put them! The editor takes a trip to York.